Innovation Celebration is recognition of those individuals and organizations that have made significant contributions, taken risks and provided leadership to ensure the continuing economic success of Champaign County, the ongoing success of the University’s economic development mission and the growth of entrepreneurial talent and energy in your community. Innovation Celebration is not merely an award for accomplishment, however, but a benchmark of success for those outstanding individuals, organizations and corporations who are nominated and selected to receive this prestigious award. Additionally, Innovation Celebration serves as a tangible collaboration between the University of Illinois and the community that clearly establishes the power of cooperation and united vision. 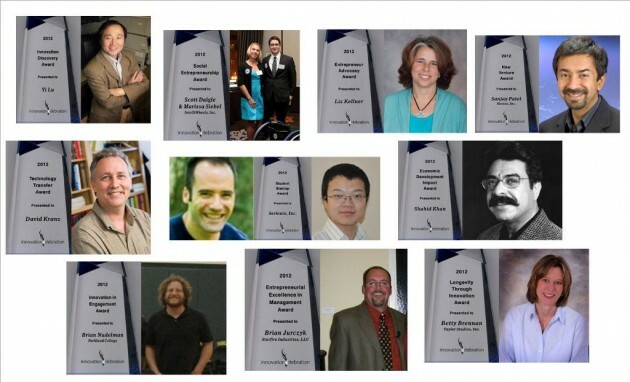 Congratulations to the 2012 Innovation Celebration Award Winners! Recognizes an individual or group from the University of Illinois’ Urbana Campus who has disclosed to the University’s Office of Technology Management a groundbreaking discovery with potential for significant societal impact. A renowned faculty entrepreneur Yi Lu has already had commercialization success with his DNAzymes for detecting heavy metals in environmental water supplies, licensed to ANDalyze a company he cofounded. His new discovery was in discovering that DNA can also be engineered to test for organic compounds such as glucose in blood and other organic markers in biological samples. Yi Lu has actively engaged with the Office of Technology Management for over 15 years, has had 41 invention disclosures, 25 filed and 14 issued patents. Recognizes an individual or group from the University of Illinois’ Urbana campus who has engaged with the University’s Office of Technology Management to successfully commercialize an innovation. As co-founder of both Immuven founded in 2008 and Biodisplay founded in 1999 (which was later sold to Abbott), Dave has demonstrated his entrepreneurial vision and capability. Immuven is currently working on developing new drugs based on the engineering of T Cell Receptor proteins to treat infectious diseases such as strep and staph, as well as cancer. T Cell Receptors have significant advantages over antibodies, as such Immuven has received SBIR grants and funding from the NIH to advance the development of a suite of products that will detect and treat antibiotic resistant organisms. Dave Kranz has worked with the Office of Technology Management for over 22 years, has 21 invention disclosures and over 20 issued patents. Recognition to an individual at Parkland College who has shown support of the college’s community engagement mission. The Service-Learning Program at Parkland College, under the coordination of Brian Nudelman, an Associate Professor in the Humanities at the College, has continued to explore and support innovative strategies by which academics and engagement in our community can work in collaboration and for the strengthening of both. From the creation five years ago of the Garden Hills Homework Club, and afterschool program that partners Parkland students and staff with 3rd, 4th, and 5th graders at Garden Hills Elementary, to the various trips the College’s Dental Hygiene Program have taken in support of dental health, both here and abroad, the Service-Learning Program at Parkland strives to put in action the College’s mission, “to engage the community in learning.” As a direct result of these efforts, Parkland College was pleased to have been named to the 2009 President’s Higher Education Community Service Honor Roll by the Corporation for National and Community Service, recognition that the College’s support of community engagement and service-learning is recognized and valued at the highest levels of our community and country. Recognizes individuals who have served as change agents in our community by incorporating innovative approaches, improving systems and processes, and creating sustainable solutions to reshape society and benefit humanity, successfully implementing entrepreneurial principles to address social concerns. Scott and Marissa are intelligent, motived and passionate about their company, IntelliWheels. While, growing their company to a profitable business is their goal, they have embarked on that mission with compassion and the hope that they are truly addressing a need that will help a group of people who are frequently overlooked. Their product came out of their observations of wheelchair users who have a hard time getting around, whether it is on varied surfaces, inclines, or as a sign of age. Outside of work, both work very hard towards promoting a world of acceptance as well as giving back to the local entrepreneurial community by mentoring those who are just starting out. The Student Startup Award recognizes an organization formed by student within the past three years whose demonstrated success is a result of entrepreneurial talent, creativity and energy, and whose future success is indicated by its current path. Serionix has developed a revolutionary technology that substantially improves the efficacy and sustainability of the water purification process. Doctoral students Jim Langer and Weihua Zheng are working with Materials Science and Engineering Professor James Economy. Jim is one of those high-energy, do-it-all kind of people whose determination and drive is something that should be awarded. While finishing his PhD, and raising a family, he manages to keep the momentum for moving Serionix forward. The New Venture Award recognizes an organization formed within the past three years whose demonstrated success is a result of entrepreneurial talent, creativity and energy, and whose future success is indicated by its current path. Nuvixa, Inc. is blazing a trail in the technology start-up ecosystem in Champaign-Urbana. This is no accident. It is a deliberate attempt of executing on a grand vision by the early founding team of Nuvixa. Nuvixa was founded in 2009 by Sanjay Patel with a desire to make video a much more useful way of communicating. His technical vision of using new sensing devices, advanced algorithms, and new computing power to radically expand what is possible with video has led to the growth of his startup company. He is a pleasure to work with, spends time building relationships and is great at listening to advice and making the best use of resources around him. Recognizes those individuals or organizations in the community who have actively engaged, encouraged, coached and mentored entrepreneurs in the community, providing a broad base of support to help multiple entrepreneurs achieve success. Throughout the years and in her various positions, Ms. Kellner has been fostering entrepreneurship in our community. By consistently visiting companies and businesses and bringing together young (and not so young) entrepreneurs, she has been pivotal in growing the synergy that is making Champaign-Urbana a high-tech community and brings us to celebrate this wonderful event. Liz has worked tirelessly in the C-U startup community for the better part of the past 20 years to help others realize their entrepreneurial dreams. Many clients recognize the entire Kellner family’s passion for the community and would go so far as to call them not only advisors, but friends. Recognizes those who have successfully commercialized innovations while demonstrating a commitment to local economic impact, with emphasis on beneficial outcomes. A native of Pakistan, Shahid R. Khan came to the United States at the age of 16 to attend the University of Illinois. As a student, he began working at Flex-N-Gate, an Urbana-based company that manufactured flexible roll-up gates for pickup trucks. By 1975, he was chief engineer for the company, a position he held until 1978. At the age of 27, Khan left Flex-N-Gate to start his own firm, Bumper Works, a company that produced an innovative, one-piece metal bumper design for trucks, eliminating welds that had the tendency to rust. The design is now considered the industry standard. Recognizes those who have best demonstrated managerial acumen and skill in assembling resources, creating an organization, decision making under uncertainty, being forward looking, and implementing action plans, and creatively solving problems. Brian Jurczyk, Starfire Industries, Inc.
Brian Jurczyk started Starfire Industries in a garage with his partner, Robert Stubbers. Over the last 7 years the company has grown to 17 employees and annual revenues of $1.4 million. They are the leaders in neutron sources and a number of other exciting technical innovations. Brian has built a fantastic team of people and found the best ways to fund the company and keep it going without any venture capital. This is an enterprise still wholly owned by him and his partners, yet it is brining real economic vitality to the region, and its products and future are extremely bright. Brian, as CEO, is in charge of finding the funding opportunities, writing proposals, negotiating contracts, making contacts, hiring, and promoting a fantastic elan within the company which has allowed it to succeed. Betty Brennan, Taylor Studios, Inc.
Betty Brennan owns and has built a very successful business from scratch. Her company is now a leader in the museum exhibit fabrication industry and their unique, high quality custom made products are highly sought after. 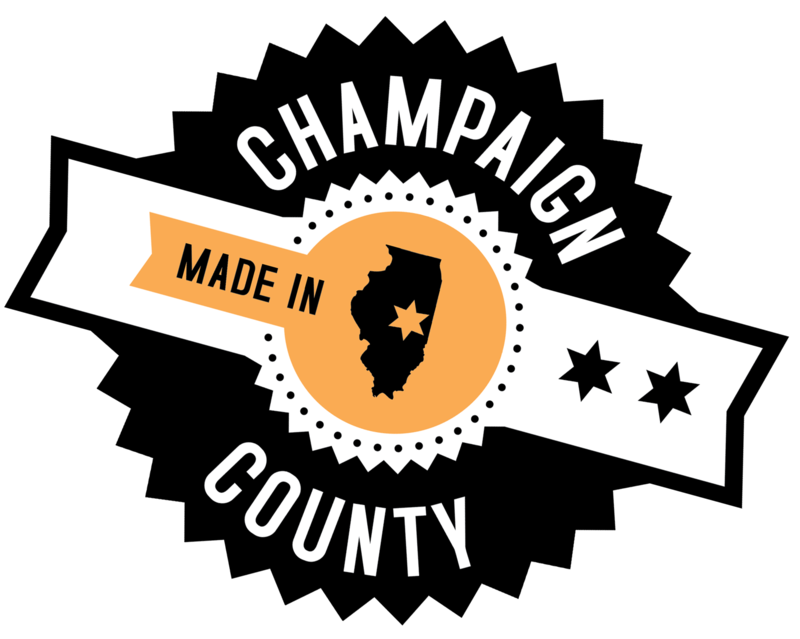 They have a world-wide client base bringing significant revenue to Champaign County from outside the community, state and country. She employs a large number of creative people and runs a well-managed, forward-thinking company using a very modern approach with a strong set of core values. For over a decade now her company has won dozens of local and national awards both inside and outside of the museum industry. Taylor Studios has been in Inc. Magazine lists 3 times so far. Betty is a caring and active part of the community, writes and shares about her business on a regular basis, and is both helpful and encouraging towards others in business. She exudes a true and classic entrepreneurial spirit with a passion for her business, her people, and her community.